Here is the recipe I made with Matt Lauer on THE TODAY SHOW in Dec. 2003 — it was lots of fun! The cake has no dried fruit at all only chunks of dark chocolate and brandied cherries and you can make the cake weeks ahead of the holidays and keep it at room temperature wrapped in a cloth soaked in brandy. It makes a great Christmas gift! 1 cup unsalted butter, at room temp. Preheat oven to 325 degrees. Butter a 9-inch springform pan, put a round of parchment on the bottom of the pan, which in turn should be buttered. Stir the baking soda into the buttermilk. Stir well and set aside (the soda will make the buttermilk foam and rise). 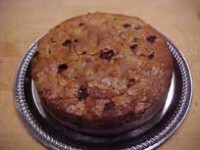 To plump the raisins, in a small saucepan, combine the raisins with 1/4 cup of the brandy. Bring to a boil, reduce heat and simmer for 5 minutes. Remove from heat and set aside to steep. To make the cake, with an electric mixer, cream butter and sugar together until light and fluffy. Beat in eggs one at a time, beating well after each addition. Into a sieve or flour sifter, measure the flour with salt. Sift the flour mixture into butter-egg mixture; stir in the buttermilk mixture and the remaining 1/4 cup brandy. Stir in the steeped raisins, and brandied cherries (with liquid), chocolate, orange zest, and nuts. Spoon into prepared pan; smooth top and sprinkle evenly with the 3 Tbs. of sugar. Press the remaining cherries into the top of the cake. Bake the cake on the top shelf of the preheated oven until the cake is firm to the touch and has pulled away from the sides of the pan, about 1 hour and 45 minutes. Let cake cool on a rack 60 minutes. Carefully turn out of the pan onto a cake plate, sugared side up. Serve warm with sweetened whipped cream, if desired.